My first introduction to quinoa salad was over 10 years ago at a macrobiotic restaurant and despite my excitement to consume the celebrated super grain I was hugely disappointed with the flavorless salad that was presented. Although I had heard rumors that quinoa is healthy, I deemed it tasteless and boring and stayed away for quite some time. When I began to see quinoa available everywhere, and learned it not only provides 8 grams of protein per cup but is a complete protein, providing all nine essential amino acids, I admitted I was missing something and began experimenting with my own different types of quinoa salads. There are over 120 varieties of quinoa but most varieties available to us are red, white and black. Although the black has a slightly earthier and sweeter taste, they are not THAT much different, so feel free to experiment with different types. I love a delicious greek salad. I just have an affinity for the large chunks of savory bell peppers, refreshing cucumbers, tomatoes and of course the fresh feta cheese. 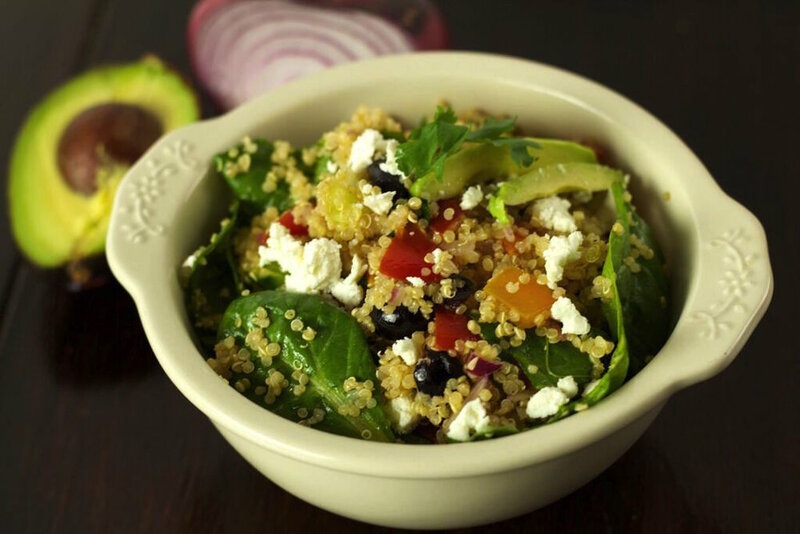 To match the delicate quinoa, I chop the veggies a bit smaller and I suggest using only quality sheep’s milk feta cheese and flavorful organic olive oil. Double the recipe for extra left overs for lunches and side dishes. Add chopped garlic & shallot to skillet w/ 1- 2 tbsp of olive oil and saute until translucent & fragrant (2 min). Add half the oregano. Turn off pan. Add 2 tsp olive oil, lemon juice, salt, pepper, balsamic vinegar to a jar w/ a lid and shake vigorously. Add chopped veggies, cooked garlic/shallots & shaken dressing to a large bowl and toss well until all veggies are completely coated.